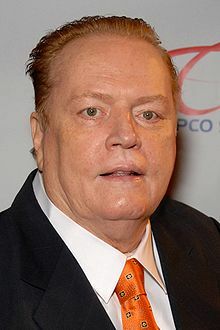 Larry Claxton Flynt (born November 1, 1942) is an American publisher, the head of Larry Flynt Publications (LFP). LFP mainly produces pornographic content, including videos and magazines, most notably Hustler. As I see it, the sole motivating factor behind the death penalty is vengeance, not justice, and I firmly believe that a government that forbids killing among its citizens should not be in the business of killing people itself. The Henry Rollins Show, episode 313. Larry Flynt's Official Response to Jerry Falwell's Death. Pine Magazine (2007-05-16). Retrieved on 2009-05-12. Larry Flynt: Don't Execute The Man Who Paralyzed Me (Guest Column). The Hollywood Reporter (2013-10-17). Retrieved on 2013-11-21. Kimora Lee Simmons after seeing a "party house", specifically after seeing an indoor hot tub with fur on the "rim" of it. Kimora: Life in the Fab Lane, episode Keepin' it Real Estate.